As part of the release of AMD’s Q1 2016 financial results (more on that later today) the company is announcing that they are forming a new joint venture to develop x86 SoCs for the Chinese market. The hereto unnamed joint venture will see AMD pair up with Tianjin Haiguang Advanced Technology Investment Co., Ltd (THATIC), who is an investment arm of the Chinese Academy of Sciences. The deal will, in a nutshell, see AMD provide the joint venture with x86 and SoC IP, along with significant engineering and other technical resources, while THATIC provides the remaining technical resources and the financing behind the venture. Overall the deal will net AMD $293 million from the licensing agreement, plus further royalties in the future. As this is a fairly complex deal, I first want to jump into the technical aspects of the joint venture. In a brief call with AMD, the company made it clear that this is an x86 play for the Chinese server market, with AMD licensing/contributing their high performance x86 IP along with their SoC IP. AMD’s GPU and ARM IP is not part of the deal, and at this time AMD is not specifying which precise x86 IP is part of the deal. 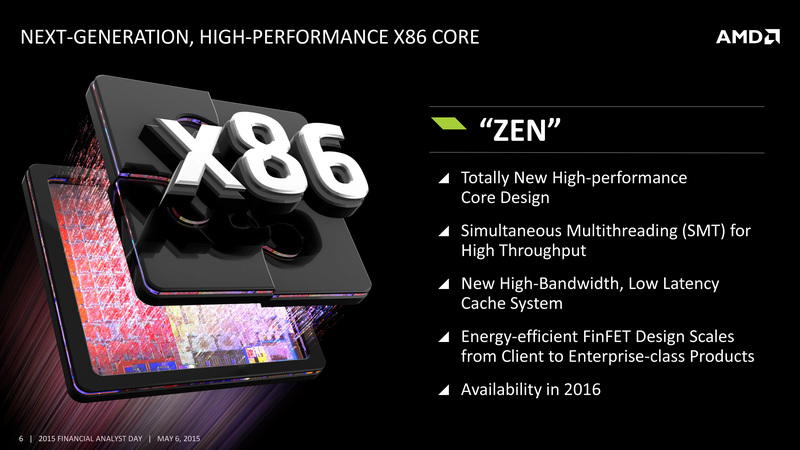 However given the timing of the announcement and the necessary ramp-up for products, I believe it’s very likely that the bulk of the x86 IP will be from AMD’s forthcoming Zen x86 processor. Either way, this a very straightforward play towards expanding x86 server processor usage inside of China. However what those products will be remains to be seen. While AMD is announcing the formation of the joint venture, their participation, and what they stand to gain, any actual product announcements are the responsibility of the joint venture. What AMD is emphasizing at this time is that this is a joint venture for high performance processors, that it is designed to complement AMD’s existing server efforts, and that the SoCs will be leading-edge products. Just what a high performance processor is – and whether that means a multicore-heavy design or something using fewer, higher performing cores – will definitely be a burning question between now and the joint venture’s own product announcements. Overall, at this point what AMD is describing does not sound like the joint venture will simply be developing cheaper, lower performing processors for the Chinese market. More obvious of an answer however is why AMD and partner THATIC would want to enter into this agreement. China as a whole continues to heavily invest in modern semiconductor technologies, both on the IP side and the manufacturing side, as semiconductors have historically been highly profitable for the winner and a good proxy for other technology development. At the same time ongoing geopolitical issues have called into question whether China can truly trust processors designed groups in foreign nations, and as a result there’s great incentive to design their own processors internally with security features specifically designed by and for the Chinese market. As AMD does not develop much of their own security technology – they use ARM’s TrustZone – this complements those needs well, seeing as how THATIC would need to contribute security technology anyhow. The end result is that this will allow the joint venture – essentially a Chinese entity – to design their own high performance x86 server SoCs to meet the performance, compatibility, and security needs of the Chinese market. This comes as the latest event in AMD’s efforts to further develop themselves into a full spectrum firm that develops processors internally and develops semi-custom designs alongside clients. The joint venture in turn takes it one step further, with AMD essentially providing IP to an outside entity and their semi-custom design, rather than the entity coming to AMD. At the same time the parallels with Intel’s own efforts in the Chinese SoC market are significant. Intel’s SoFIA program to develop Atom-based SoCs for China and other emerging markets by pairing up with Chinese SoC designers is quite similar in ambition, though aimed at the opposite end of the market. For AMD this represents a crucial opportunity to re-enter the server market. In the long run AMD sees a greater presence in servers and the enterprise as being key to their success, as the server market is overall much more profitable than the client market, not to mention growing at a time where the client PC market is at best stagnant. 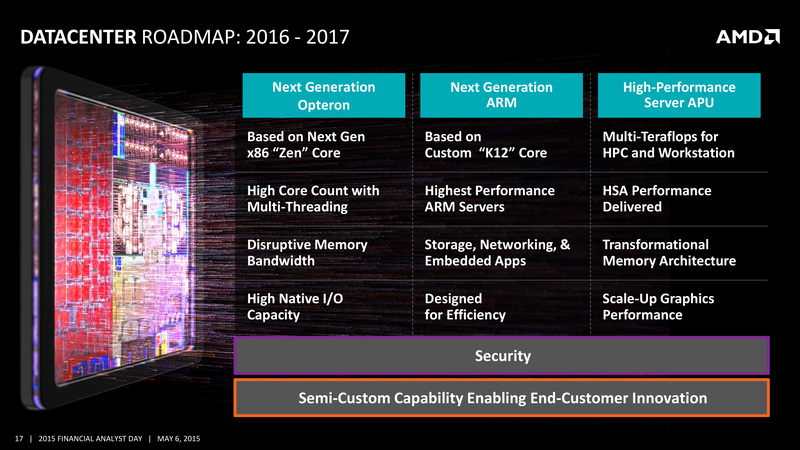 Going this route means that AMD can attempt to get back into the market without facing Intel entirely head-on, by providing a product (or rather the IP behind it) that Intel currently cannot. Meanwhile it also provides AMD some leverage in the long run for further increasing the sales of their own x86 Opteron processors; if the joint venture’s x86 SoCs are successful, then AMD’s job convincing other customers that their products offer the right mix of technology, performance, and cost will be all that much easier. This has been something of a challenge for AMD in recent years as Intel has largely sewn up the server market, and customers have become hesitant to leave Intel. Meanwhile, one other technical detail we’re going to have to wait on the joint venture itself to announce is where these products will be fabbed. AMD describes the venture as an initiative to produce leading-edge chips, which if taken at its word implies that the resulting chips would be produced on current-generation FinFET technology as employed by Intel, TSMC, and the Samsung/GlobalFoundries duoship. At the same time however, given the desire to produce chips specifically for the Chinese market, the joint venture may also want to use a Chinese fab. In which case it’s not immediately obvious who they might use. Also not immediately obvious is where this falls under the Intel/AMD x86 cross-licensing agreement. AMD has of course done their own research and says that this doesn’t violate the agreement. However whether Intel agrees with that remains to be seen; it will likely take them some time to form their own legal opinion. In the meantime and at first glance, because this is a joint venture, it would appear that AMD is in the clear here as they aren’t giving the technology to another business, but rather are using it as part of a new line of products they are developing, albeit in conjunction with an outside firm. Finally, let’s talk about the financials and other business aspects of the deal. Overall this is a pure technology investment for AMD; they are not putting any money into the joint venture, but they are contributing a significant amount of technology and technological expertise. It will be partner THATIC that supplies the funding for the venture, along with the remaining IP and expertise. Importantly, this means AMD doesn’t have any financial risk in the joint venture, and should it not pan out then AMD doesn’t lose any of their already limited financial resources. On the up side however, AMD stands to gain significantly from the deal if it goes well. The initial joint venture licensing agreement calls for AMD to be paid $293 million – spread out over multiple payments that are contingent on the joint venture hitting certain milestones – while AMD will also receive royalty payments on future processors. At a time when AMD is still trying to pull back into the black, the agreement and promise of royalties is significant. And since the company already had a virtually non-existent presence in the Chinese x86 server processor market, while this deal does, from a practical perspective, limit AMD’s ability to sell Opteron processors to China, a fraction of even a moderately successful product line would represent a significant improvement for AMD. At this point we don't have any further information on when the joint venture will be announcing their first products, but we'll be keeping a close eye on the development of AMD's newest venture. Although China calling on AMD can't alone turn around the company's fortunes, for AMD this represents their best chance in years to get back into the server market, and re-attain the profitability that they badly need. Lenovo offers Thinkpad E series and various Ideapad models with AMD CPU's. Even the Thinkpad X100/X120/X130s are AMD E350/E450-based. @Samus: "But there's nothing worse than a Lenovo AND an AMD Processor. Talk about poor reliability and lack of battery life..."
@Samus: "Even the Thinkpad X100/X120/X130s are AMD E350/E450-based." Intel owns their own reverse engineered version of x86 64 bit (Intel 64), they don't need AMD64, this violates the terms of a 2009 cross-licensing agreement between AMD and Intel. That agreement says neither party can transfer rights to licensed technology to other companies. “I’m sure Intel is going to have major issues with this. Also exports of advanced semiconductor technology are subject to U.S. government export controls, which seek to limit the transfer of technology that could affect national security. "Intel 64" is just Intel's name for x86-64 and there's no need to "reverse engineer" something they already have licensed and work with intimately. Would a cook have to reverse-engineer a cake when he already has that recipe? Well, you could reverse engineer it, but the courts would not recognize it as original, which is what matters here.